Members of the Symphytum genus are hardy perennial herbs that range from 30 cm to 1.2 m in height. Depending upon the variety, they may bloom from the latter part of spring until the first frost of winter. They have attractive varicolored leaves and carry clusters of small pink, blue, purple, white, or yellow bell-shaped flowers. Common names for members of the genus include Blackwort, Knit-bone and Comfrey. Symphytum officinale by Matt Lavin. If growing as a herb, then harvest the leaves after three years of growth, just before flowering occurs. Common Names: Comfrey, Blackwort, Boneset, knitbone, consound, Slippery-root. Height: 12 to 40 inches (30—100 cm). Flowers: Late spring until the first frost. Flower Details: Blue, cream, purple, yellow, pink. Bell-shaped. Tubular. Clustered. Nodding. Foliage: Herbaceous. Variegated. Large. Elliptic. Erect stems. Plant Outside: Grown from its rhizomatous roots. Bury at 3 to 6 inches (8—15 cm). Early spring or autumn. Space at 40 to 48 inches (100—120 cm). Sow Inside: Full sunlight (for best results) or partial shade (leads to smaller plants). Rich, moist soil. Soil pH 6.5 to 7.5. Regular watering. Cut off dead leaves in the autumn. If using for external medicinal herbal use, then harvest from plants that are at least three years old before blooming occurs. Propagate: by taking root cuttings or by division in the spring or in autumn. Miscellaneous: Used in traditional Austrian medicine to treat locomotor system and gastrointestinal tract disorders. Considered an invasive plant in many areas. 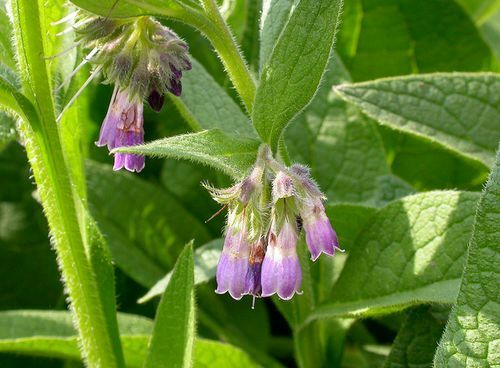 It is best to grow Symphytum plants from root cuttings; these should be buried in autumn or early spring at about 10 to 15 cm deep with a spacing of about a metre. Ideally they will grow in a sunny part of the garden where they will thrive: they tolerate shady conditions, and enjoy a rich soil of pH 6.5 to 7.5 that is kept moist. Blackwort, Comfrey and other Symphytum take a little bit of caring for. They like a moist soil so keep well watered. Divide the plants every year to stop them growing too close together. In the autumn it is necessary to remove dead Blackwort leaves. If you require more plants then they can be propagated by taking cuttings from the root in the spring, or easier still plant out divided plants when tidying up.